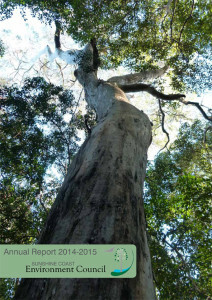 The annual report for the 2014/15 financial year was adopted at the Annual General Meeting on 18 June 2015. The report looks back on one of our busiest years to date with some great campaign successes and terrific growth in our support base. An enormous vote of thanks goes out to all the 105 volunteers who contributed over 3,200 hours of their time during the year. Without these willing workers SCEC would not be able to stand up for our environment in the way we have these past 12 months.